We were excited when we received an invitation from Roving Heights to attend The Book Banters with Nkiru Olumide-ojo. What’s better than hanging out with other book lovers at a bookshop? Maybe reading the books perhaps. 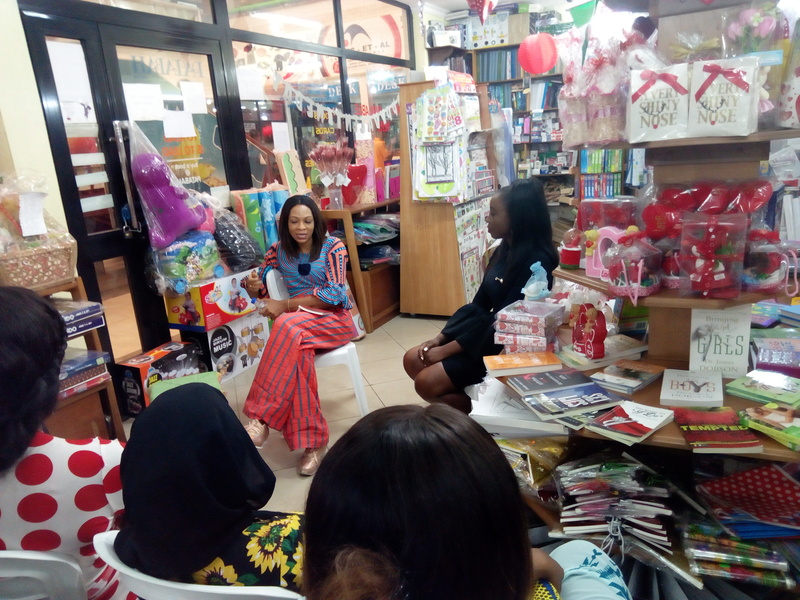 The event took place yesterday on Sunday 28th of January at Patabah Bookshop in Surulere. For those who attended, you’ll agree with us that the book reading was one of a kind. The event was not only highly educative and enlightening, it was also filled with fun conversations and loads of refreshments. You know what they say, when books, fun and food come together, they make history! For those who didn’t attend, really where were you? To be honest, you did miss a lot. The author of the book, Nkiru Olumide-Ojo read portions of the book as shared the inspiration behind the book. She also gave some useful tips to the women present, admonishing them to be strong and be courageous enough to go for what they want. 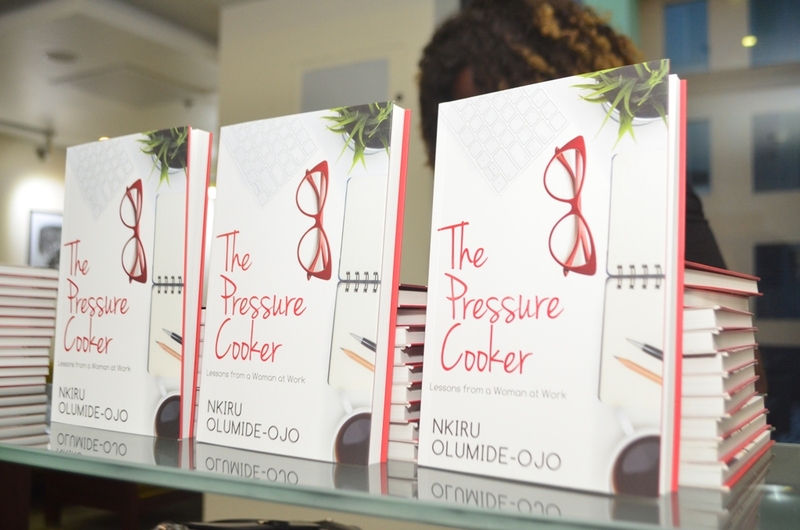 When asked why she chose the title, ‘The Pressure Cooker’ for her book, Mrs Olumide-Ojo’s answer was simple – she felt she was under so much pressure, like she was boiling in a cooker, and it inspired her to write the book, to encourage other women out there who are also under pressure, and to teach women how to juggle it all together. The host of the event, Olive Emodi really did a great job in steering the conversation to the right direction causing the author to share deep insights from her book. The beautiful event ended with photographs and a book signing. Well done to the Roving Heights team. You rock! If you would like us to attend your book reading or book club event, please send an email to thesparklewritershub@gmail.com. #WordOfTheDay – Ever heard of groggy? It is pronounced as [GROG-ee]. It is an adjective that means dazed; weak or unsteady as from lack of sleep, tiredness, sickness, intoxication, etc. The word has a weird origin or etymology. It came from the nickname of Admiral Edward Vernon (1684-1757), who ordered diluted rum to be served to his sailors (and thus helped coin the term grog). The admiral earned the nickname from his habit of wearing a grogram cloak. Grogram is a coarse fabric of silk, wool, mohair, or a blend of them. There was more than enough alcohol to make a full grown person groggy. The series of sleepless nights made Adams groggy. This is to all those writers who want to create a market for their writing. There is a need for consistency in your writing. Being a consistent writer gives you some sort of leverage over the other writer who does one article, maybe per month or one story in two months. It is simply logical that you will improve your writing skills by writing every time. The quote above says you have to be a continuing writer. Writing has to be a continuous act for you to create a market for your writing. There are certain writers who have carved a particular niche for themselves because they have written several novels, books or articles that have pegged them as either fiction writers or no-fiction writers or sci-fiction writers and so on. Therefore, dear writer, write all the time. Continue writing and never stop writing. #PickOfTheWeek – Is there anything like a perfect fit in love? Four incredibly talented writers are on our Pick this week. Let’s start with Muhamad Gbolahan’s piece. There are a number of reasons we love this. Maybe its because he points out that we would not always have it easy or because he reminds us that even in those tough circumstances we need to find light at the end of the tunnel. We say this over and over but once in a while it is good you hear it from another source. Never be afraid to pour your heart out on paper. Victory goes on to give insight about love and finding the perfect fit. Hard work really isn’t a crime but even if it is Blessing thinks we should be ready to commit that crime over and over again. Thank you for reminding us of this truth Blessing! Want to be featured on our next #PickOfTheWeek series? Simple! Tag us when you post on instagram. Have you ever read books that mentally wore you out? You know, those kinds of books that leave you confused? If you have, then it would not be too difficult to appreciate a good book that takes you, seamlessly, from one part of the story to the other. What this means is that clear writing is pivotal in making your piece understood by your readers or audience. You definitely do not want someone reading your article or write up and coming out of the reading experience with a headache. Sigh. We would be giving you tips on how to make your writing better and clearer. It is important that you have a plan before writing. A plan includes some sort of guideline to help you in your writing. This is important because a plan helps you to fix in and delete what needs to be in your writing as well as what needs to be deleted from your writing. Whenever you eventually finish writing, make sure you arrange it in such a way that there is a logical flow of thought. Make sure you include everything that needs to be covered within the scope of your writing. You need to read through your work to make sure there is a flow of thought in your writing as a whole. You need to be detailed enough to include linking words if the need arises. Linking words or transitional words help to link words, phrases, clauses and paragraphs together in a coherent way. Examples of transitional words are; in addition, equally, identically, however, although, then again, after all and so on. This is crucial because there are things that might not catch your attention even after reading through a couple of times. It might take someone else to point out that flaw or that idea that you unintentionally left out. Be open to ideas and corrections from other people. This would help a great deal in your writing. We do hope these tips are helpful. Hello Bloggers, we are back with our big words! If you have been thinking about blogging tools to use for an effective blogging experience, think no more because you are in the right place. Although the names may sound strange, these tools get the job done. This tool helps you optimize your website at a fast rate. Wondering how? It reduces your images by 70%. How interesting is this tool? The best part about it is that it is free. All you have to do is drag your photos or upload them to optimizilla.com and download after they have been compressed. You can then upload the already compressed version of the photo on your blog. This tool does not discriminate against any image or photo. All photos are welcome. Optimize your blog posts for specific keywords. We do hope this will help you make the most out of your blogging experience. It’s not every time you get to talk to a writer who has authored nine critically acclaimed books, including Sugar, The Warmest December, Gathering of Waters (one of The New York Times Editors’ Choice Books of 2012), and Glorious, which was featured in O, The Oprah Magazine and was a contender for the NAACP Image Award. This writer, Bernice L. McFadden is a three time Hurston/Wright Legacy Award finalist, as well as the recipient of multiple awards from the Black Caucus of the American Library Association (BCALA). If you have ever been rejected as a writer, you need to read this interview. Bernice got seventy five rejection letters for one book! You see why this interview originally published on Writers Write is a must read? Bernice shares her journey as a writer and there is a lot to learn from it. My home life was very tumultuous. And I spent a lot of time in the library. That was a safe haven for me…I sought refuge in books and in writing…I knew I wanted to be a writer since I was about nine. I would steal my mother’s Jackie Collins books and mimic them. That was kind of like erotica. My mother would read this and be horrified. When I was about twenty-five I started submitting on a regular basis. I submitted Sugar for over ten years and got over seventy-five rejection letters….I didn’t give up because this was what I really wanted. I sent my first agent a query letter on February 9, Alice Walker’s birthday. A magical day for me…When I got an agent it took him two weeks to get me a two book deal. I love them all differently. If I had to pick I would say Sugar because it was my first. The Warmest December is also a favourite because it was about my family…Tony Morrison wrote a blurb for it, so that was a big thrill. I write and research at the same time…I’ll read things I that I find inspiring… I read a lot of poetry. I like lyrical passages. I spend a lot of time walking because a lot of the writing goes on in my head before I put it on paper. Today I walked so far I didn’t know where the hell I was. It’s a lot of research, a lot of reading and a lot of walking. At the begging of my writing process I feel like I have people coming to visit. Like one or two people. When I am really engrossed in the writing my house is full…All I’m doing is recording what I hear. As I get close to the end my house starts to empty out. It feels melancholy and lonely without the character’s voices. …The first sentence. It’s always tough getting started. Even though I’ve been doing this for eighteen years when I sit down to start a new project I’m a novice again. I’m unsure. People feel that rejection is a horrible thing. Rejection can be life sustaining if you look at it as fuel for the fire. You should think, “I’ll show you.” It’s your dream and you should have it. Your time will come…Learn, acquire the skill. Your time will come. Hey Sparkle Writers, our word for today is pretty simple – ‘Senectitude’. The word looks really serious but it is not as serious as it looks. First, it is pronounced this way [si-NEK-ti-tood]. It sure does sound nice, doesn’t it? It is a noun meaning old age (We told you it was not that serious). The origin of the word is from the Latin word ‘senectus’ meaning old. Senectitude comes with its own fair share of problems. It is high time people embraced the reality of senectitude. This is one insightful post from the great Stephen King. It brings to the spotlight the purpose or motive for writing. Writing should not be about being famous, making money and all of those other superficial things. Rather, it should be about enriching lives. Yes we need to make money but it should not be the ultimate reason why we write. Will it not be beautiful thing if someone wrote you a mail saying that your work pulled him or her out of depression or suicidal thoughts? That would be awesome. No amount of money can even remotely compare to that testimony. At least, that’s what we think. Dear writer, write to enrich lives because the more lives you enrich, the more your life gets better for it. Never forget these powerful words from Stephen King as you go about your writing activities for the day or the week or the month or the year.